International aid groups, including Turkey's Prime Ministry Disaster and Emergency Management Authority (AFAD) rushed to respond on Saturday to a massive earthquake in Nepal that claimed more than 1,000 lives as aftershocks and severed communications hampered rescue efforts. It was reported that AFAD will be dispatching a search and rescue team consisting of 25 people, and a medical aid team consisting of 10 people to Nepal on Saturday. Another search and rescue crew consisting of 45 people is also expected to be dispatched on Sunday, along with humanitarian aid. The Turkish Red Crescent has also announced that they will be sending aid consisting of 1000 blankets and 300 food parcels to the victims of the earthquake in Nepal on Saturday night. "We do not yet know the scope of the damage, but this could be one of the deadliest and most devastating earthquakes since the 1934 tremor which devastated Nepal and Bihar," said Jagan Chapagain, Asia/Pacific director of the International Federation of the Red Cross and Red Crescent Societies (IFRC). The IFCR said it was extremely concerned about the fate of rural villages close to the epicentre of the quake, some 80 kilometres (50 miles) from the capital Kathmandu. "Roads have been damaged or blocked by landslides and communication lines are down preventing us from reaching local Red Cross branches to get accurate information," said Chapagain in a statement. "We anticipate that there will be considerable destruction and loss of life." Other aid organisations responding to the emergency also struggled to assess the needs with communications cut off around the Himalayan nation. "Communication is currently very difficult. Telephone lines are down and the electricity has been cut off making charging mobile phones difficult," said Cecilia Keizer, Oxfam country director in Nepal. "People are gathered in their thousands in open spaces and are scared as there have been several aftershocks," she added. French aid group Action Against Hunger (ACF) said in a statement its teams in Nepal "were on their way to the affected areas to assess the damage and the needs" to mount a humanitarian response. 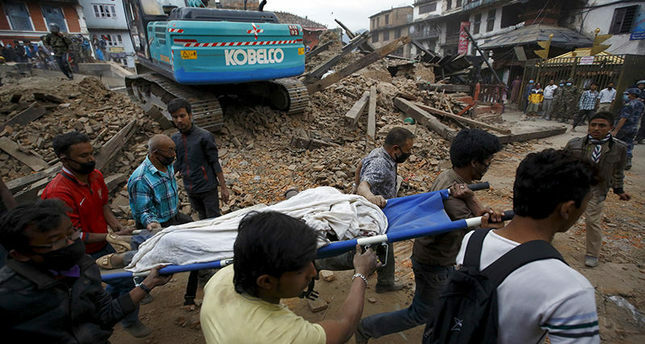 Nations around world have also reacted to the deadly 7.8 magnitude quake that rocked Nepal on Saturday. The United States is sending a disaster response team and has authorized an initial $1 million in aid to address immediate needs, the US Agency for International Development said. The European Union also said its humanitarian experts were heading to the crisis areas. "The full extent of the casualties and damage is still unknown but reports indicate they will likely be high, both in terms of loss of life, injuries and damage to cultural heritage," the EU statement said. Condolences to the Nepalese people and all those affected by the devastating quake came from leaders across the globe, including China's Xi Jinping, France's Francois Hollande and Russia's Vladimir Putin. In Europe, Britain, Germany and Spain also pledged support and assistance, with Norway promising to provide 30 million krone ($3.9 million, 3.5 million euros) in humanitarian aid. "It is now important to get an overview of what the needs are so that relief efforts can be brought in as quickly and efficiently as possible. The funds will be channelled through the UN system and NGOs," said Norwegian Foreign Minister Borge Brende in a statement. In Nepal's capital Kathmandu, office towers and apartment blocks have collapsed and the main hospitals are functioning but stretched to capacity, the IFRC said. "I was in my fifth floor apartment and the shaking was extremely violent... we could see dust rising from the hills around the city and luckily we were able to evacuate," said a British Red Cross worker in Kathmandu. Strong aftershocks risk causing further damage to buildings and have triggered fears among the local population, many of whom are afraid to return to their homes, the IFRC said.